In appreciation of relative peace. It is Sunday, which means that one can have a lazy snooze and leisurely ablutions on the sofa, in the knowledge that no builders, plumbers or other ne’er-do-wells will disturb one’s peace until tomorrow morning. True, the humans seem to have been very busy today and there is a noticeable lack of… well… everything, in two rooms of the house now. but they are one’s personal humans and so relatively trustworthy. 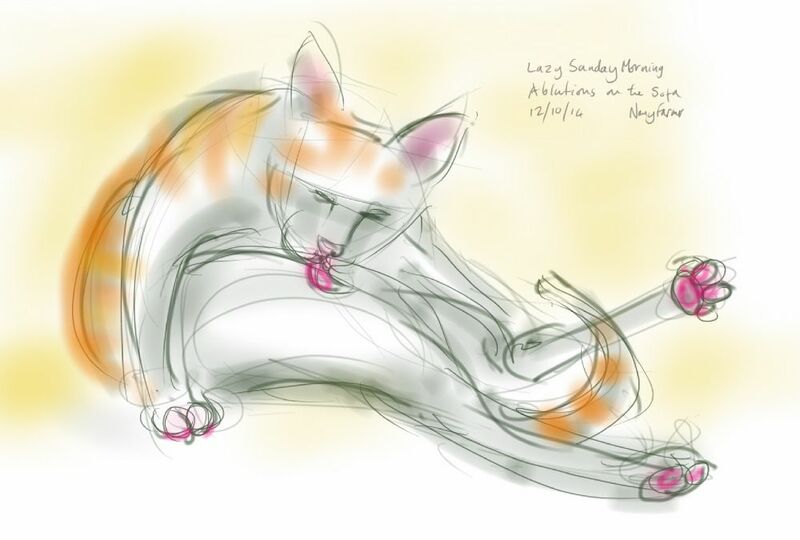 This entry was posted in Cats and tagged art, cat drawing, cat washing, cat-of-the-day, digital sketch, drawing, ginger and white, life drawing, Percy Cat, tablet sketch on October 12, 2014 by Nancy Farmer.